Baby (Chihuahua) in the Shoulder Collar. 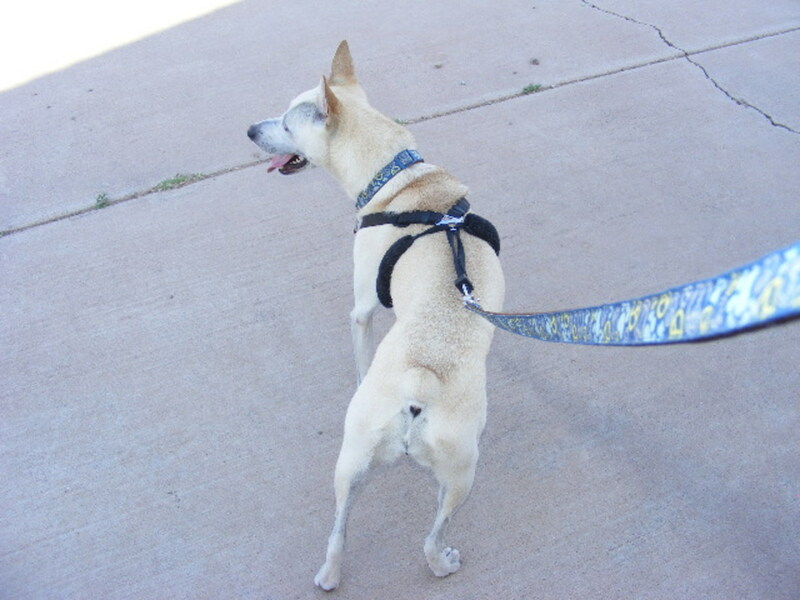 Step-in Harnesses are easy on everybody - dogs and people! Dog harnesses come in many styles, but here at our dog boutique Golly Gear, among our very favorites is the Step-in Style. Step-in harnesses are easy to put on, easy to take off, are generally easy to adjust, and completely eliminate all the fussing with straps going every-which-way. 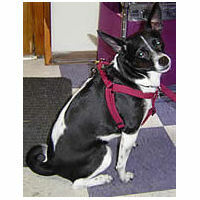 Since most aren't put on over the dog's head, Step-in Harnesses are great for dogs who are sensitive about that. 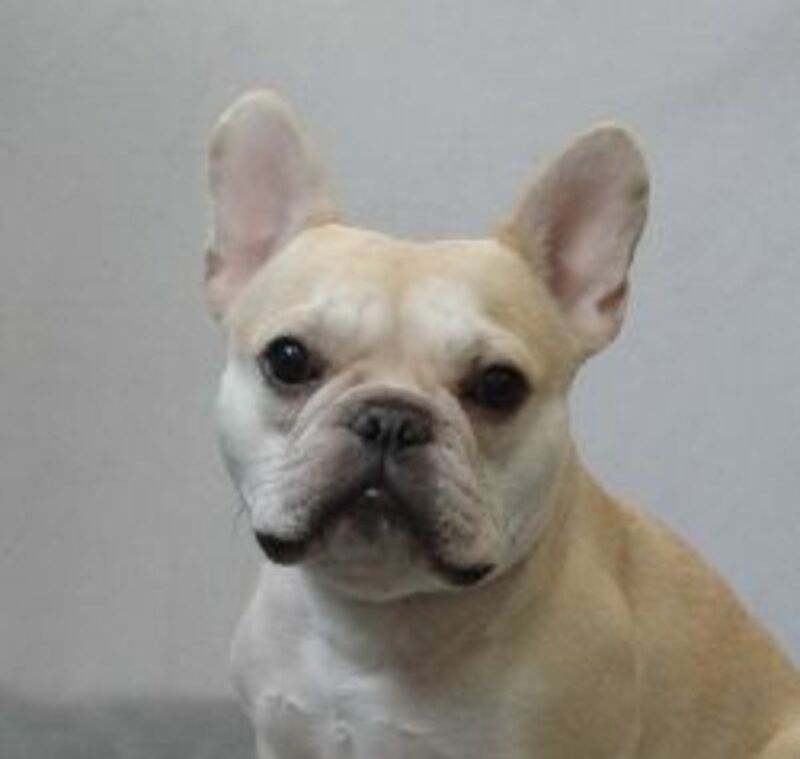 There's a "right" Step-in Harness for any dog; without buckles for dogs who can't stand the sound, without velcro for dogs who are sensitive to that material, lined for dogs with sensitive skin, leather for dogs with silky hair, made of recycled soda bottles for eco-friendly dogs. Truly an innovative new design in step-in harnesses, the PerfectFit combines the best features of vest-style harnesses (soft, wide straps) and step-in harnesses (easy-on, completely adjustable). The PerfectFit even has a v-neck design, to insure that dogs won't choke. 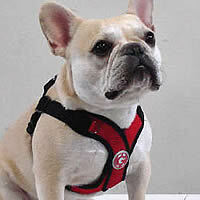 The adjustable straps in the back are made of faux-suede, very soft for dogs with sensitive skin or issues with chafing. Saki (Japanese Chin) in the Plaid Step-in. 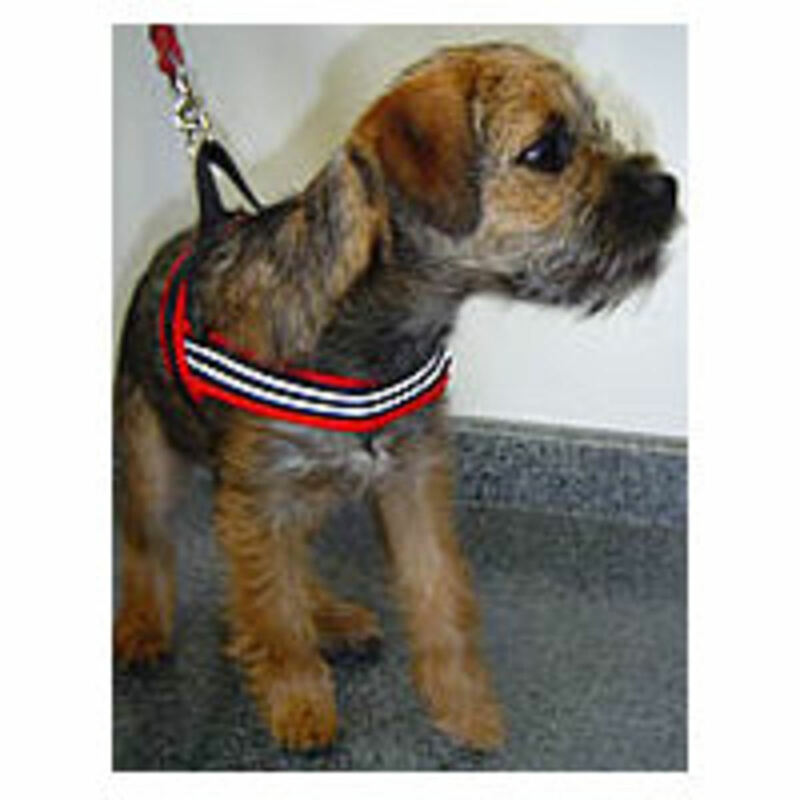 The Plaid Step-in Harness is a classic! 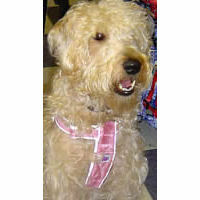 Easy to fit, easy to use, easy to adjust, comes in a wide range of sizes and colors to suit almost any dog. Sturdy and still adorable - a perfect introduction to the Step-in style. The Plaid Step-in is made in Canada of strong nylon webbing - strong enough to stand up to pulling, soft enough to conform. The Mutt Gear Harness from Doggles is not only adorable, sturdy and easy to use - it's environmentally-friendly, made from recycled soda bottles! Extra touches make it special - reflective edge piping, a padded chest strap and an included car restraint loop. This harness covers all the bases - cute, comfy, safe and eco-conscious! Unique in design and execution the Shoulder Collar Step-in Harness is the perfect answer for those worried about collapsed trachea, a relatively common problem for small dogs. The Shoulder Collar, made of soft leather, encircles the dog around the shoulders - no pressure at all at the neck. It is designed to fit exactly - no adjusting, no confusing straps, just an elegant strip of leather, doubly secured by hook-and-loop closure and any leash clasp. The Shoulder Collar is both easy and elegant. An everyday essential, the Solid Step-in Harness from Timberwolf is the harness you'll reach for every day - for walks around the block, quick trips to the pet store or vet. The front, back, and center straps are all adjustable - every dog can have a custom-fit harness with this canine wardrobe basic. The Solid Step-in is available in eight rich colors - sure to complement any color canine coat. 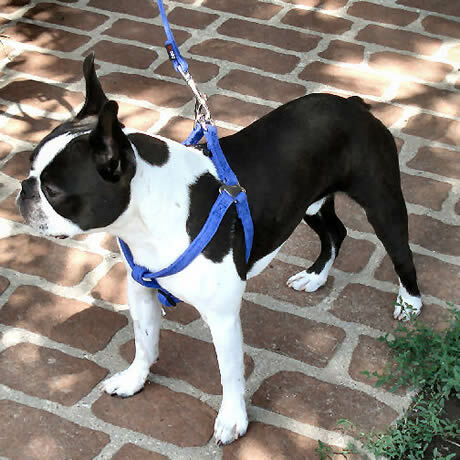 Booker (Boston Terrier) in the Microfiber Step-in Harness. 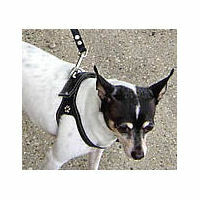 The Microfiber Step-in Harness takes the next step in style for harnesses. 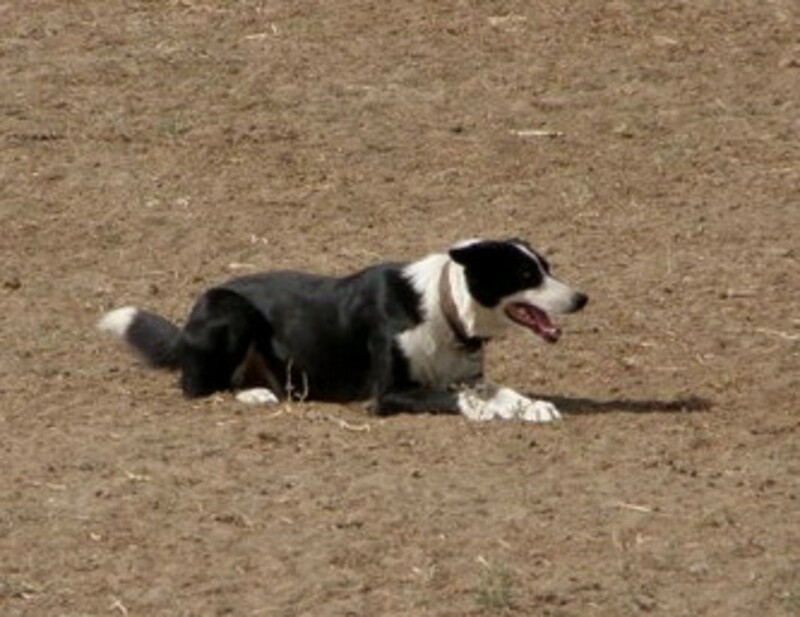 Microfiber material is soft, washable, and easy on the dog. Sleek European-design touches at the connectors. 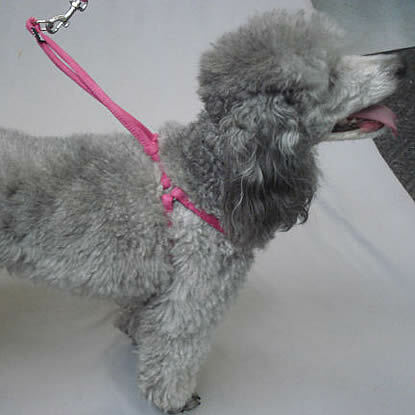 All straps are adjustable, making sure your dog has a custom fit, regardless of her shape or size. Available in fashion-forward colors - lime, purple, and brown. 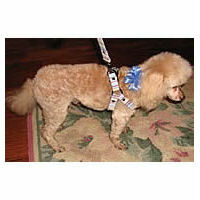 The Rolled Microfiber Step-in Harness is a wonderful choice for dogs with silky coats or sensitive skin. The soft microfiber fabric glides is less likely to irritate sensitive skin and the rolled design glides better through fur.. The one-piece design, with leash and harness all-in-one, is easy to use - the dog simply steps into the harness, the sliders glide down the lead to hold it in place, and off you and your pup go! The epitome of simple elegance, in design and performance. 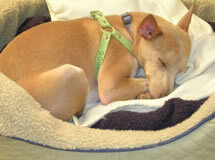 The faux-suede Luxury Harness & Leash Set is so comfy that Jack (Rat Terrier) even sleeps in his! Designed to fit dogs from 5 to 18 pounds, the Luxury Harness is available in numerous colors and has wider straps to maximize comfort. 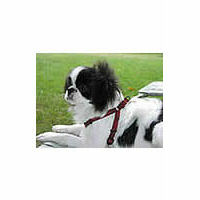 The Luxury Harness, which comes with a matching leash, is a stylish basic for your dog's comfort. 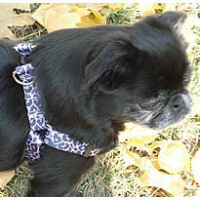 This light-and-airy Spring Step-in Harness from Gooby is made of cotton with breezy, refreshing patterns. Available in either flower or striped patterns, the Spring Step-in is adjustable for dogs from 5 to 18 pounds and even comes with its own matching leash. Both practical and stylish - Yellow Dog Design Step-in Harnesses come in a wide variety of splashy patterns and adorable designs. 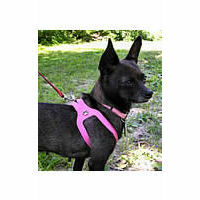 Just because it's sturdy, well-made, adjusts easily and fits beautifully doesn't mean a harness can't be adorable, too! And Yellow Dog proves it! We know the choices can be overwhelming. Which is why we're always happy to help. 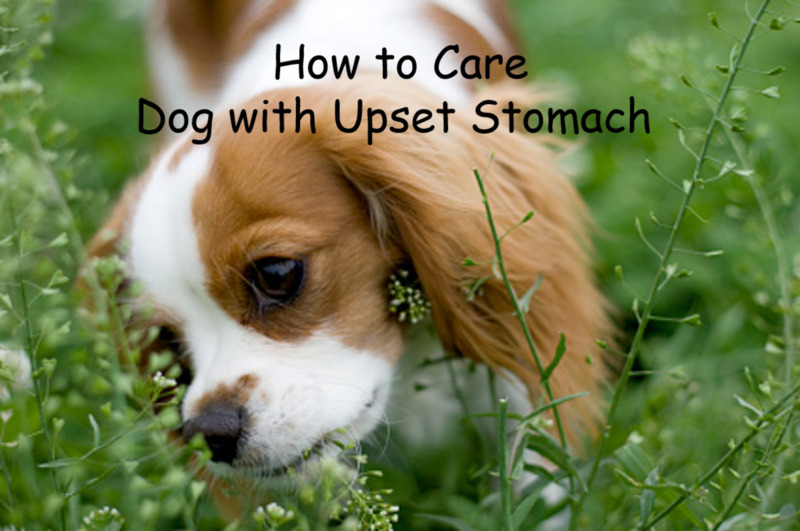 You can even get a better idea of our best choice for your dog - right now! GollyGear.com's Do It Yourself Harness Selector will ask you a series of easy questions, leading you to some terrific options for your dog's next harness. 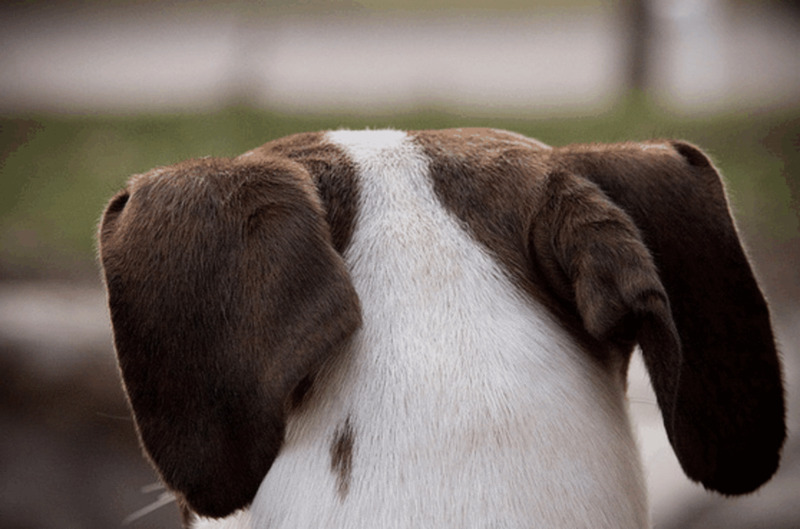 Yes, you can train your dog with a harness! I have 2 standard labradoodles and they do pull on the leash a bit. I will try the training methods in the youtube. They are brothers and the difficulty has been training them both at once. I love all of your wonderful harness.